I am using Byethost free hosting service for about 3 months now and I think this will already provide an enough gauge to evaluate its performance. I signed up for Byethost early April of this year to setup my own self hosted blog. This blog is my blog, Atomophile which serves as my testing area for wordpress. Atomophile also contains the April archive found here in SpideyLab. To know more about this story, read SpideyLab Launch. Byethost is a hosting company under iFastNet that primarily offers free web hosting service. It is considered as the most fastest free hosting provider that has quite enough resources to run a basic website or blog. Byethost is around since 2005 providing quality service to webmasters. It offers unlimited storage and bandwidth and limited number of possible add-on and parked domains, MySQL databases and email accounts.Despite of being “unlimited”, the service somehow impose limitations that are not readily understood by the customers. This is the main reason of complaints about this service. Byethost imposes inodes and daily hits limit for every free account. Inodes are simply the number of files that are contained in the server while daily hits are the number of requests in a server. Even Byethost offers unlimited storage and bandwidth, these two rules are the bottleneck for a true unlimited service. So, 500 page views is only enough for a low traffic site. Of course, not all sites do contain 100 files per page. It is really a case to case basis. The unlimited bandwidth still holds true if you, for example has a whooping large 20MB webpage size that only require 30 requests per page. This translates to about 1700 page views and a total bandwidth requirement of 34GB per day! And yes, Byethost can give you that. Well, this is quite unrealistic though. Unlimited storage for the win! But wait. There will be always a catch with a free service (and even paid ones). This time, it is the strictly imposed Inodes limit! Byethost imposes a 1,500 inodes limit for a free account. Meaning, you can only have a maximum of 1,500 files in your account, including the core files of wordpress, if you are using the platform. It doesn’t matter how large a file is. That means, you can have 1,500 files that is 100MB each or you can have 1,500 files that is 1MB each. It doesn’t matter. They are just the same 1,500 inodes. This is the major factor to consider in evaluating a hosting service. The maximum CPU limit, as well as RAM available for each user. I am not sure about the value Byethost imposed for CPU resources. Most of hosting providers give about 20% to 30% of the CPU utilization available per account. Of course, this is not the same for all. It depends on the CPU of the server and other factors. This is quite fast considered it is a free host. It will become even faster if you completely run your website through a CDN like Cloudflare. A standard webpage that weighs 1-2MB should completely load within 3 seconds. Beyond this time is considered as a slow performing website. The values are all above 99%. Service disruptions don’t last longer than 15 minutes. Response times are stable with some high treshold. In this monitor, it is worth noting that there is a downtime caused by Error 500. It lasted for more than 30 minutes. The test domain does run purely on Byethost server (not Cloudflare enabled). 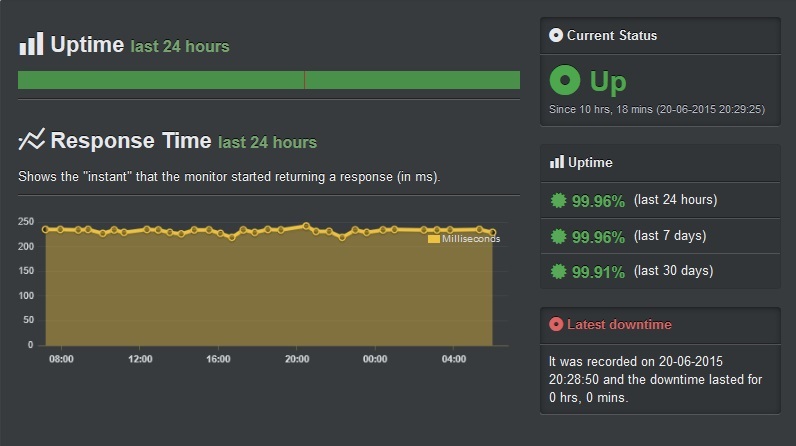 Despite of the pretty long downtime, the server was still able to provide a solid 99.91% uptime for the last 30 days which is quite good. 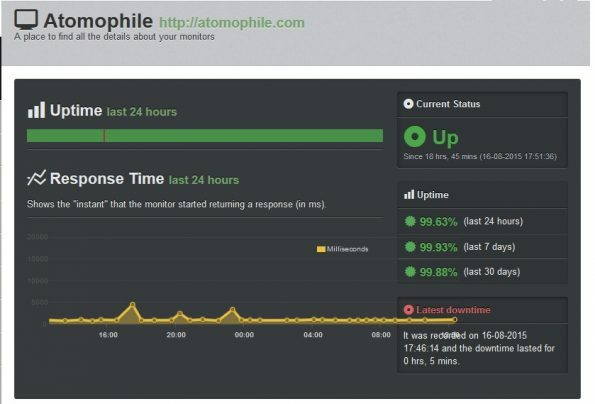 See Status Cake uptime report for Byethost here. 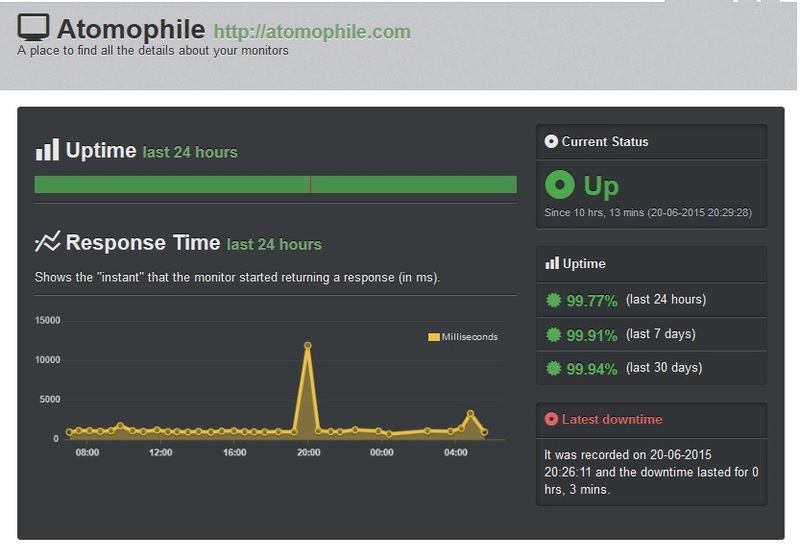 Note: Atomophile.com is now transferred to a new hosting service for another testing purposes. 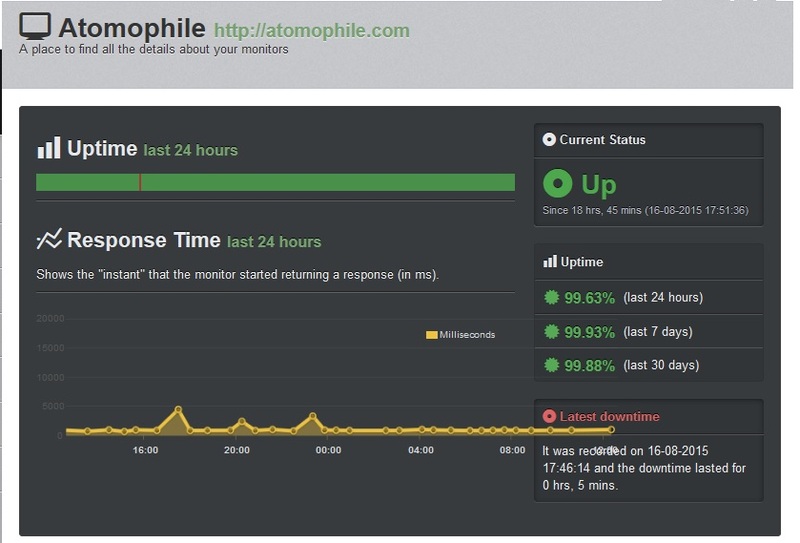 Nonetheless, the StatusCake report is still valid since it monitors a different website that is still with Byethost. There are some modules that are not activated in free accounts. Hence, if you use WordPress, there are some plugins that will not work correctly. Page loads sometimes hit a insanely low value of 500ms (in Pingdom). I do not have anything to complain in terms of speed. Indeed, it is one of the fastest (if not the fastest) free host I had ever tried. The free hosting service of ByetHost is good provided that you comply with their regulations. The service is available for so long and will continue for the next years. You do not have anything to worry about your whole website being lost suddenly. But of course, you should make your own backups time to time. Is Byethost a recommended free host? You might also get interested on reading: Free, Paid, Premium or Cheap Hosting: You Get What You Pay For and Hostinger Free Web Hosting Review.